Emotions are contagious. If someone smiles at you, it’s hard not to smile back. And if someone barks in anger at you, well, you know yourself. 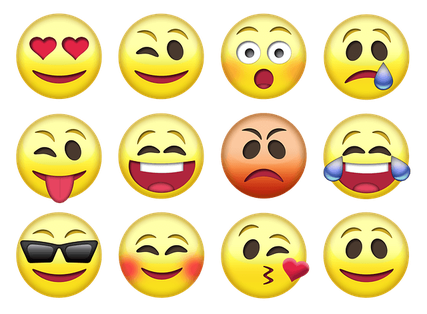 The contagious power of emotions – especially negative emotions – is obvious on social media, particularly Twitter. Things can get nasty on Twitter; people say all kinds of things they would never say in face-to-face conversations. One person disagrees with another, things get heated as others join in to defend their friend, insults get hurled and the contagion spreads. Soon enough, it’s no longer enough to say the other person is wrong or misguided – s/he is a bigot, a scumbag, a loathsome person who should rot in Hell. Emotions are contagious. If someone smiles at you, it’s hard not to smile back. And if someone barks in anger at you, well, you might feel pretty angry yourself. In this week's Southern Star, my column explores how the contagiousness of emotions – both good and bad – can be especially obvious on social media. As always, the column will be reproduced on this blog next week. Are you a worrier? Are you prone to 'what if...?' thinking? Does not worrying make you feel unsafe and irresponsible? My column in this week's Southern Star offers some advice on kicking the worrying habit. As always, the column will be reproduced on this blog next week. Are you happy with the choices you’ve made in life? Whose life are you living? How concerned should you be by other's opinions? My column in last week's Southern Star is reproduced below. How concerned should you be by the opinions of others? Are you happy with the choices you’ve made in life, or were those choices swayed by social pressures? Those questions came to mind after reading a recent article by Paul Dolan, author of a new book called Happy Ever After: Escaping the Myth of the Perfect Life. Dolan, who comes from a working-class background, is a respected happiness expert and Professor of Behavioural Science at the London School of Economics. However, that brings its own expectations. He relates how he was once involved in a panel discussion at a festival. Afterwards, a man approached him to say how he liked Dolan’s first book, Happiness by Design, before pointedly adding: ‘But why do you have to play the working-class hero?’ Dolan, he said, had twice cursed during the panel discussion. ‘When you reach a certain level’, he was told, ‘you have to modify your behaviour’. How concerned should you be by the opinions of others? Are you happy with the choices you’ve made in life, or were those choices swayed by social pressures? My column in this week's Southern Star explores what Prof. Paul Dolan, author of a recent book called Happy Ever After?, has to say about these important questions. As always, the column will be reproduced on this blog next week. Everyone knows what it's like to experience tough times. Last week's Southern Star column took a closer look at Aware's CBT-based Life Skills programme, which begins in Kinsale next week. The column is reproduced below. Life can be tough at times. Everyone knows what it’s like to feel stressed, to feel sad, to worry, so it’s vital we learn the life skills that equip us to deal with everyday challenges and to improve our quality of life. Life Skills, then, is an appropriate name for the free (refundable deposit of €30 required, or €10 if unwaged) six-week group programme run by the mental health charity Aware. I’ve delivered a number of Life Skills programmes for Aware and will be doing so again in a fortnight, when the programme will be held in the Trident Hotel in Kinsale. My column in this week's Southern Star takes a closer look at Aware's CBT-based Life Skills programme, which I will be delivering in the Trident Hotel in Kinsale in a fortnight's time. Developed by Dr Chris Williams, professor of psychiatry at the University of Glasgow, Life Skills is a very user-friendly programme that helps people to learn about how we think and how these thoughts can influence our actions in helpful or unhelpful ways. As always, the column will be reproduced on this blog next week. As for Life Skills, places are still available. Booking handled by Aware; to book, please see https://ti.to/Aware/life-skills-march-2019. Moving forward: CBT focuses largely on the present, not the distant past. 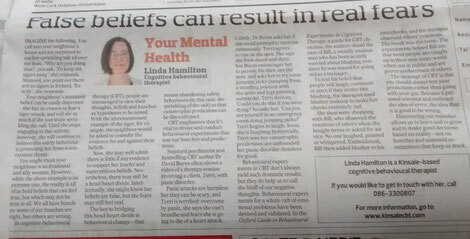 In last week's Southern Star, I explained why CBT largely focuses on the here and now rather than the distant past. The column is reproduced below. “I’m very good at the past. It’s the present I can’t understand”. That line – from a character in Nick Hornby’s novel High Fidelity – is one many people will relate to. Focusing on past events might help you understand where a problem originated, but it does not necessarily solve that problem or improve your day-to-day life. That’s why cognitive behavioural therapy (CBT) largely focuses on the here and now. Dr Harry Barry gives the example of someone stuck on a motorway after suffering a puncture: is it better to have the skills to know how to change the tyre or to walk miles back to the scene of the puncture? Now, there are exceptions. With some difficulties – for example, post-traumatic stress disorder (PTSD) or childhood trauma – past events obviously tend to be a focus of therapy. Additionally, it’s fair to say all of us are shaped by our past and develop core beliefs about ourselves at an early age, beliefs that can shape our adult behaviour. Nevertheless, it’s important to be aware that the factors that can start a problem are not necessarily the same ones that keep a problem going. To give another example, one used by the late Oxford CBT expert Prof. David Westbrook; look for the factors keeping a fire going rather than looking for the match that started the fire. Happy moments are precious but can make some people feel unsafe. Book shelves groan under the weight of guides devoted to the question of obtaining happiness. But what if the thought of being happy unsettles you? What if feeling good leaves you feeling bad? Last week's Southern Star explored a very real problem - fear of happiness. The column is reproduced below. Fear of happiness is a real thing found all over the world, according to a 2013 study investigating attitudes towards happiness. The researchers devised a Fear of Happiness scale which asked people if they agreed with various statements, including: 'I prefer not to be too joyful, because usually joy is followed by sadness'; 'I believe the more cheerful and happy I am, the more I should expect bad things to occur in my life'; and 'Excessive joy has some bad consequences'. Book shelves groan under the weight of guides devoted to the question of obtaining happiness. But what if the thought of being happy unsettles you? What if feeling good leaves you feeling bad? My column in this week's Southern Star explores a very real issue that is more common than you might think - fear of happiness. As always, the column will be reproduced on this website next week. In this week's Southern Star, I note that while the physical benefits of exercise are well known, keeping active is also vital for maintaining mental fitness and well-being. As always, the column will be reproduced on this blog next week. One resolution worth making is to better look after your mental health in 2019. 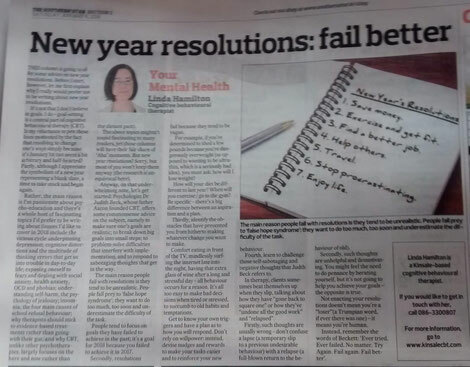 In last week's Southern Star, I offered some advice regarding New Year resolutions to boost mental health. The column is reproduced below. Last week's Southern New Year resolutions can be counter-productive – all too often, people beat themselves up for not following through on their overly-ambitious plans. One resolution worth making, however, is to better look after your mental health. Here’s some simple advice that can help boost your well-being in 2019. This simple idea comes from psychologist Prof Jonathan Haidt in his thoughtful book The Happiness Hypothesis. ‘How many of your New Year’s resolutions have been about fixing a flaw?’ asks Haidt. ‘And how many of those resolutions have you made several years in a row? It’s difficult to change any aspect of your personality by sheer force of will, and if it is a weakness you choose to work on, you probably won’t enjoy the process. If you don’t find pleasure or reinforcement along the way, then – unless you have the willpower of Ben Franklin – you’ll soon give up. But you don’t really have to be good at everything. Life offers so many chances to use one tool instead of another, and often you can use a strength to get around a weakness’. New Year resolutions can be counter-productive – all too often, people beat themselves up for not following through on their overly-ambitious plans. One resolution worth making, however, is to better look after your mental health. 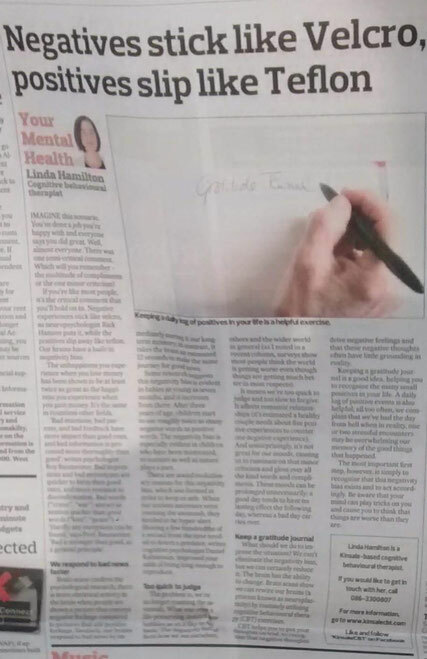 My column in this week's Southern Star offers some simple tips that can help boost your well-being in 2019. As always, the column will be reproduced on this blog next week. If you’re worried about a loved one, be open and talk to them. It’s commonly assumed that suicide rates rise at Christmas. In fact, the opposite is the case, but suicide rates do tend to spike on New Year’s Day. Why so? And what can you do if you’re concerned about a loved one? My column in last Thursday's Southern Star is reproduced below. Contrary to popular belief, suicide rates typically decrease in December and over the Christmas period. The main reason is that while Christmas can bring its own stresses, it also tends to be a time of increased connectedness, family time and social support. However, multiple international studies show this is followed by a notable spike in suicides on New Year’s Day. There are a number of factors at play here. Some people may postpone a planned suicide so family and friends can enjoy Christmas. Alcohol is a depressant while simultaneously loosening inhibitions, so excessive alcohol consumption on New Year’s Eve can be dangerous. Then there is what psychologists call the “broken promise effect” – the disappointment that follows when something a person had been excited about fails to live up to raised expectations (this broken promise effect is thought to be a factor in the fact suicides often rise after holidays and weekends). It’s commonly assumed that suicide rates rise at Christmas. In fact, the opposite is the case, but suicide rates do tend to spike on New Year’s Day. My column in this week's Southern Star explores why it's important to know the facts around suicidality and offers some advice for people who may be concerned about a loved one. As always, the column will be published on this blog next week. The spotlight effect: are people really looking at you? Others pay less attention to us than we think. Last week's Southern Star column examined the 'spotlight effect' - the tendency of people to think all eyes are upon them, even when others may be paying little or no attention. The column is reproduced below. All of can think of times when we’ve experienced socially embarrassing moments – spilling your drink on someone you’re trying to impress, your voice breaking when making a speech, tripping over your feet in a busy place and keeping your head down to avoid seeing the smirks from all the people around you. But what if you’re wrong? What if it’s in your head, and people aren’t really paying much attention to you at all? Cognitive psychologist Dr Thomas Gilovich performed a pretty funny experiment to test out this theory. He asked college students to wear a yellow Barry Manilow T-shirt and walk into a room full of strangers (Manilow, a 1970s star best known for hits like “Mandy” and “Copacabana”, is ‘a musician who is not terribly popular among college students’, noted Gilovich). He then asked participants to guess how many people would notice their cheesy T-shirt. About half the students thought it would be noticed; in reality, only around 20 per cent of people noticed it. Would you be self-conscious if you were asked to wear a yellow Barry Manilow T-shirt in front of a room full of students? Do you think everyone would take notice of your cheesy T-shirt? Or is it possible people won't take much. if any, notice? My column in this week's Southern Star explores what psychologists call the spotlight effect - the tendency of people to think that "the social spotlight shines more brightly on them than it really does". As always, the column will be reproduced on this blog next week. CBT – what's it all about? 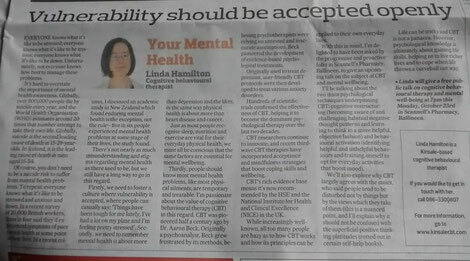 In last week's Southern Star, I explored some frequently asked questions (FAQ) in relation to CBT. The column is reproduced below. Cognitive behavioural therapy (CBT) has been around for over half a century and there’s more awareness than ever before about its benefits. Still, when I mention I’m a CBT therapist, I’m often asked the same questions. What is CBT exactly? Is it about thinking positive? What makes it different to other psychological therapies? So here goes – CBT in 700 words. CBT aims to help you manage problems and improve quality of life and mental well-being by changing the way you think (cognitive) and act (behavioural). What is the theory behind CBT? CBT emphasises that thoughts, feelings and behaviours are interlinked and strongly influence each other. Negative or fearful thinking can lead to negative feelings that drive negative behaviours. CBT says our emotions are influenced not so much by events and situations, but how we see these events and situations. Well, say two equally-qualified people see a job advertised. One person thinks, “Great, I’d love that job”. This thought creates feelings of hope and excitement and the person applies for the job. The second person thinks, “I won’t get it anyway, they’ll think I’m useless”. This thought leads to negative feelings (sadness, hopelessness, etc) and negative behaviours (they don’t apply for the job). This is a simplistic example, but the point I’m trying to make is that the situation here is not inherently good or bad; it is the person’s interpretation of the situation, their self-talk, that is driving their feelings and behaviours. So CBT is about thinking positive? No – CBT is about realistically evaluating your thoughts and learning to think and act in a balanced, helpful way. Seeing the glass as half full is great, but CBT doesn’t suggest you cod yourself into thinking black is white or vice-versa. I often say there are three ways of managing a difficult situation – sometimes, you should try and change it; other times, you should change the way you look at it; other times, you may have to accept it (continued below...). Cognitive behavioural therapy (CBT) has been around for over half a century and there’s more awareness than ever before about its benefits. Still, when I mention I’m a CBT therapist, I’m often asked the same questions. What is CBT exactly? Is it about thinking positive? What makes it different to other psychological therapies? My column in this week's Southern Star examines these and other questions. As always, I'll reproduce the column on this blog next week. All children and teenagers feel some anxiety about school – that’s normal. Refusing to attend school, on the other hand, is a serious matter that can have damaging long-term consequences. How should parents manage school-refusal behaviour? In this week's Southern Star, I offer evidence-based advice on how to manage school-refusal behaviour. As always, the column will be reproduced on this blog next week. Complaining can become an ingrained habit. In last week's Southern Star, I noted that while it's only right and proper to complain when you've been wronged, complaining can also become a bad habit, negatively impacting on your mood and on the moods of others. The column is now online. Lots of people really like to complain – about the weather, about the boss, about the politicians, about the neighbour up the road who borrowed your corkscrew and who has yet to return it. How much complaining is too much? Now, there are many good reasons why we complain. If you’ve been treated badly, it’s perfectly legitimate to complain about it. The alternative – bottling up your frustrations and saying nothing – fosters bitterness and leaves you alone in your pain. That aside, we’re human and you shouldn’t beat yourself up if you vent on occasions; getting a few things off your chest after a long day can be a form of stress relief. Many people will say complaining helps them to feel heard and to feel less alone. Other times, people complain for the craic of it. ‘Nothing has surprised me quite so much as the fact that I miss the giving out’, said Irish Times columnist Jennifer O’Connell after she left Ireland for America. Her point is echoed by comedian and Giving Out Yards author Tara Flynn. ‘Giving out is the national pastime, a way of bonding, even therapy’, she said. ‘If you’re talking raising complaint to an art form, the Irish are full-blown Michelangelos’. We underestimate how much other people will like us. We underestimate how much other people will like us, according to a new study. I explored this 'liking gap', as it's known, in last week's Southern Star. The column is reproduced below. It can be awkward and intimidating when you meet someone for the first time. On such occasions, you might feel you messed up in some way, that you said the wrong thing at the wrong time, that the other person is unlikely to think much of you. You’re probably wrong. Chances are, the other person has a higher opinion of you than you think they do. That’s according to a new psychological study, ‘The Liking Gap in Conversations: Do People Like Us More Than We Think?’ In the study, individual participants were asked to have a short conversation with another participant. After, they rated how much they liked the other person and how much they thought the other person liked them. People consistently underestimated the other person’s opinion of them, the researchers found. Shy people were especially prone to this ‘liking gap’, but it was true of all personality types. Quite simply, people like us more than we think they do. It can be awkward meeting someone for the first time. You might feel you messed up in some way, that the other person probably didn't think much of you. You’re probably wrong; the other person probably has a higher opinion of you than you think they do, according to a new study called 'The Liking Gap in Conversations: Do People Like Us More Than We Think?’. In this week's Southern Star, I explore the findings of the study. As always, the column will be reproduced on this website next week. It's important to learn to manage anxious thoughts. 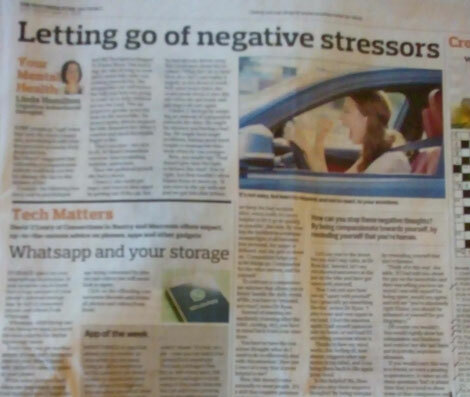 Last week's Southern Star column explored how to manage worries by using the 'best/worst/most realistic' technique. The column is reproduced below. You’re a bit stressed. Your annual performance review at work is taking place next week and you’re worried as to what your boss is going to say. How can you best manage those anxious thoughts? Here’s a simple CBT (cognitive behavioural therapy) technique to try out. Ask yourself three questions: what’s the worst that could happen? What’s the best that could happen? What’s the most realistic outcome? Worst case: The meeting with your boss goes worse than you expected. He brings up a problem that you were unaware of. He’s unhappy as to how to how you managed a recent work situation and you leave the meeting feeling embarrassed. Best case: The meeting goes very well. Your boss is happy with your performance. He also gives you some simple tips as to how you can continue to improve. You’re hoping to be promoted in a few years’ time so you’re glad to have gotten this useful advice, which you intend to implement. You leave the meeting feeling motivated and optimistic. Realistic case: Your boss is quite happy with your work. He mentions a few areas where you could be doing better (time-keeping, how best to manage difficult customers), but you know this already and realise it’s nothing personal. Overall, it’s a relatively uneventful meeting. What’s the worst that could happen? What’s the best that could happen? What’s the most realistic outcome? 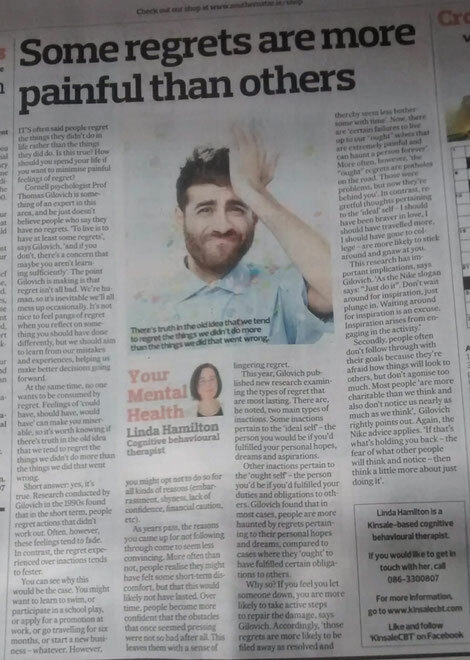 I'm in this week's Southern Star, where I discuss the 'worst/best/most realistic' technique, a simple CBT strategy that can help you manage various anxiety-related thoughts. As always, the column will be reproduced on this blog next week. The more newness in your life, the longer it seems. 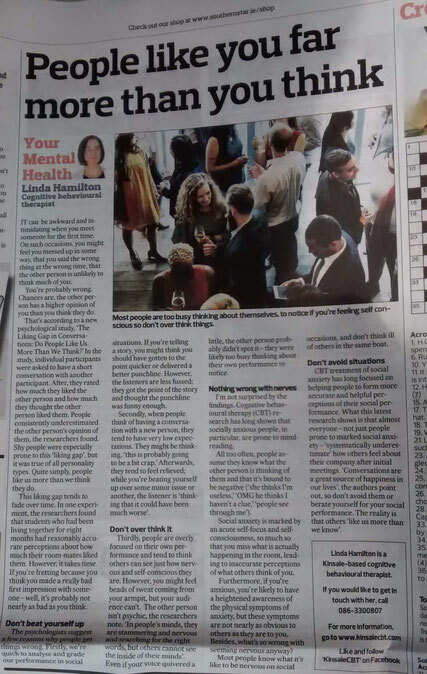 In last week's Southern Star, my 'Your Mental Health' column explored how novelty and variety make time seem to go slower, and how new experiences keep us fresh and help us to feel alive. The column is reproduced below. Sometimes, time flies. You might look back on an event and say: time has flown, it’s hard to believe that was 10 years ago. Other times, the opposite is the case: a weekend might seem as long as a week, a week as long as a month. What’s going on? What is influencing our perceptions of time? For the same reason, time seems to go more slowly when you holiday in less familiar locations. You pay more attention to all the newness around you; you may experience more novelty in a day than you would in a month at home. To give a personal example, I recall a somewhat ambitious driving holiday abroad some years back. A typical day might have began with breakfast in some city hotel, hitting the road in a hire car, briefly stopping off in several picturesque old towns, and travelling long distances on the way to the next destination. Every day brought new landscapes and new experiences. It felt like a long holiday, as if I had been away forever. In fact, it was a brief break – I was away for only six nights. Sometimes, time flies. You might look back on an event and say, it's hard to believe that was 10 years ago. Other times, the opposite is the case: a weekend might seem as long as a week, a week as long as a month. Why so? In this week's Southern Star, my column explores the importance of novelty and variety, and how time goes slower when you pack your days with new experiences. As always, the column will be reproduced on this blog next week. "Negative experiences stick like velcro, while the positives slip away like teflon". You might receive dozens of compliments and a single critical comment, but that one negative comment is the one you remember. Why so? In last week's Southern Star, I explored how we have a built-in negativity bias and why "bad is stronger than good, as a general principle". The column is below. Imagine this scenario. You’ve done a job you’re happy with you’re with and everyone says you did great. Well, almost everyone. There was one one semi-critical comment. Which will you remember – the multitude of compliments or the one minor criticism? If you’re like most people, it’s the critical comment that you’ll hold on to. Negative experiences stick like velcro, as neuropsychologist Rick Hanson puts it, while the positives slip away like teflon. Our brains have a built-in negativity bias. The unhappiness you experience when you lose money has been shown to be at least twice as great as the happiness you experience when you gain money. It’s the same in countless other fields. ‘Bad emotions, bad parents, and bad feedback have more impact than good ones, and bad information is processed more thoroughly than good’, writes psychologist Roy Baumeister. Bad impressions and bad stereotypes are quicker to form than good ones, and more resistant to disconfirmation. Bad words (“crime”, “war”) attract attention quicker than good words (“love”, “peace”). ‘Hardly any exceptions’ can be found, says Prof. Baumeister. ‘Bad is stronger than good, as a general principle’. Brain scans confirm the psychological research; there is more electrical activity in the brain when people are shown a picture that conveys negative feelings compared to pictures that stir positive feelings. Similarly, our brains respond to bad news by immediately storing it our long-term memory; in contrast, it takes the brain an estimated 12 seconds to make the same journey for good news. Some research suggests this negativity bias is evident in babies as young as seven months, and it increases from there. After three years of age, children start to use roughly twice as many negative words as positive words. The negativity bias is especially evident in children who have been mistreated, so nurture as well as nature plays a part. There are sound evolutionary reasons for this negativity bias, which was formed in order to keep us safe. When our ancient ancestors were roaming the savannah, they needed to be hyper-alert. Shaving a few hundredths of a second from the time needed to detect a predator, writes cognitive psychologist Daniel Kahneman, improved your odds of living long enough to reproduce. You’ve done a job you’re happy with you’re with and everyone says you did great. Well, almost everyone. There was one one semi-critical comment. Which will you remember – the multitude of compliments or the one minor criticism? 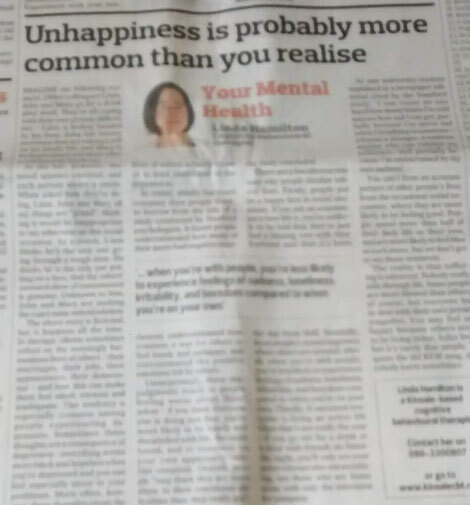 In this week's Southern Star, my mental health column explores our built-in negativity bias and why, to quote psychologist Roy Baumeister, "bad is stronger than good, as a general principle". We regret the things we didn't do in life more than the things we did do. In last week's Southern Star, I offered some advice on how to minimise painful feelings of regret. The column is reproduced below. It’s often said people regret the things they didn’t do in life rather than the things they did do. Is this true? 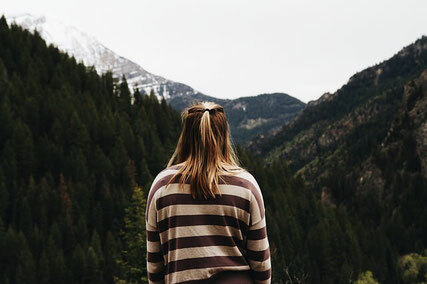 How should you spend your life if you want to minimise painful feelings of regret? Cornell psychologist Prof Thomas Gilovich is something of an expert in this area, and he just doesn’t believe people who say they have no regrets. ‘To live is to have at least some regrets’, says Gilovich, ‘and if you don’t, there’s a concern that maybe you aren’t learning sufficiently’. The point Gilovich is making is that regret isn’t all bad. We’re human, so it’s inevitable we’ll all mess up occasionally. It’s not nice to feel pangs of regret when you reflect on something you should have done differently, but we should aim to learn from our mistakes and experiences, helping us make better decisions going forward. At the same time, no one wants to be consumed by regret. Feelings of “could have, should have, would have” can make you miserable, so it’s worth knowing if there’s truth in the old idea that we tend to regret the things we didn’t do more than the things we did that went wrong. It’s often said people regret the things they didn’t do in life rather than the things they did do. Is this true? How should you spend your life if you want to minimise painful feelings of regret? Are some regrets more painful than others? The topic of regret is the subject of my column in this week's Southern Star. As always, I'll publish the column on this website next week. OCD is characterised by obsessive thoughts and/or compulsive behaviour. Obsessive compulsive disorder (OCD) can be painfully debilitating. It's important to understand OCD rather than making ill-informed jokes about it, as I explained in last week's Southern Star. Organised people often laugh about how they’re “so OCD” in their ways, but obsessive compulsive disorder is no joking matter. Earlier this year, reality TV star Khloe Kardashian was criticised by mental health campaigners after she launched KHLO-C-D Week, a series of posts documenting ‘tips and tricks’ for keeping things nice and tidy. There are two reasons why tidy people shouldn’t use such language. Firstly, OCD is not a personality trait; it’s a serious mental illness that can be incredibly debilitating, one ranked as among the 10 most handicapping conditions by the World Health Organisation (WHO). Organised people often laugh about how they’re 'so OCD' in their ways, but my column in this week's Southern Star explains why obsessive compulsive disorder is no joking matter. As always, the column will be reproduced on this blog next week. The world is getting better in most respects but surveys show most people think it's getting worse. This overly dramatic worldview can have consequences for our mental health, as I explained in last week's Southern Star. A question: over the last 20 years, the proportion of the world’s population living in extreme poverty has (a) almost doubled, (b) stayed the same, or (c) almost halved. The correct answer is C – extreme poverty has halved. Steady progress has been made for some time. In 1966 half the world lived in extreme poverty, but that had fallen to 9% in 2017. 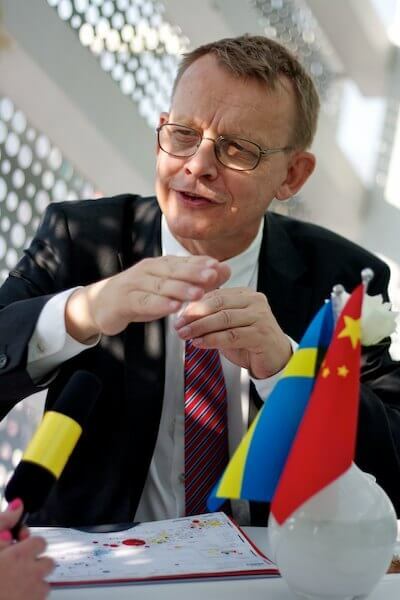 However, few people are aware of this progress, according to surveys carried out by the late physician and statistician Hans Rosling. In most countries, fewer than 10% answered correctly. The same pattern was evident in questions asked about vaccination rates, population growth, education levels for girls, and various others questions. The world is getting better, but almost everyone thinks it’s getting worse. How is this related to mental health? Well, firstly, negative media coverage makes the world seem a worse place than it really is, and this has consequences. Cognitive psychologist Steven Pinker cites a literature review which found consumers of negative news are prone to “misperception of risk, anxiety, lower mood levels, learned helplessness, contempt and hostility towards others.” They also become fatalistic, adds Pinker; why vote or donate money when things keep getting worse anyway? The world is getting better in most respects (declining poverty, improved vaccination rates, education levels for girls, etc) but surveys show almost everyone thinks it’s getting worse. Why so? I discuss this question in this week's Southern Star and explore how our thinking biases can have consequences for our mental health. As always, the column will be reproduced on this blog next week. To fight your fear of flying, you must learn to tolerate discomfort. Many people are excited at the prospect of flying abroad for their summer holidays. For others, however, the thought of flying is enough to bring them out in a cold sweat. Fear of flying is common. An estimated one in four people are nervous about flying. For around one in 10 people, the problem is especially acute. People fear many different things about flying. Obviously, many are scared for one simple reason - they’re afraid the plane will crash. A more common fear is the fear of having a panic attack on board. The fear of being trapped, of crowds, of heights - all of these can be triggered by the flying experience. Other people may have trust issues and hate the feeling that they have no control over events. Broadly speaking, however, most flight phobics fear that they will become overwhelmed by anxiety during the flight. People who suffer from fear of flying can be divided into three main groups. There are those who don’t fly or haven’t flown for many years, despite having the chance to do so; others will fly only if it’s absolutely necessary and will suffer huge anxiety on the flight; others will fly when they need to, but with anxiety. Many people are excited at the prospect of flying abroad for their summer holidays. For others, however, the thought of flying is enough to bring them out in a cold sweat. 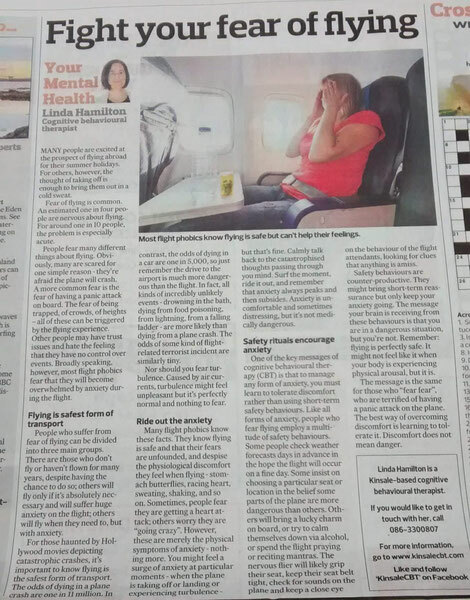 In this week's Southern Star, I offer some CBT-related advice on how people can fight their fear of flying. As always, the column will be reproduced on my blog next week. All of us are prone to common thinking errors. In CBT, these thinking errors are known as cognitive distortions – essentially, irrational thinking patterns that often drive low mood, anxiety and relationship conflict. 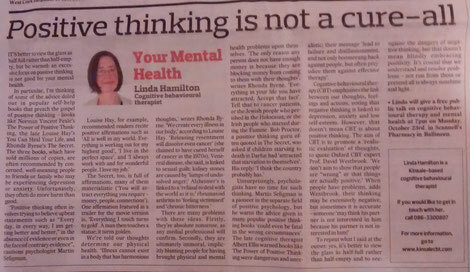 In this week's Southern Star, my column looks at nine cognitive distortions that we should all be aware of. As always, I'll reproduce the column on my blog next week. It’s important to praise children but be careful – sometimes, the wrong type of praise can backfire, as I discuss in this week's Southern Star, which is now on the shelves. As always, the column will be reproduced on this website next week. It's important to learn to manage stress. In last week's Southern Star, I discussed how cultivating a compassionate mindset can help people to better manage the daily stresses of life. The column is reproduced below. Some people go “ugh” when they hear the word compassion, associating it with what they perceive as touchy-feely do-gooderism. But what if I suggested that cultivating a compassionate outlook could help you better manage the day-to-day stresses of life? Consider the following true story, told by psychologist and MyTherapist.ie blogger Dr Elaine Ryan. One morning, she was driving to work and a motorbike rider was coming towards her. She stopped her car well before the “lolly pop” lady was going to come up to help children across the road. This appeared to greatly upset the man on the motorbike. He slowed down, almost stopped his bike, leaned in her driver’s window and stuck his middle finger at her. That’s not nice – not nice at all. Dr Ryan’s immediate reaction: heart pounding, surprise, annoyance. Once she gathered herself, she had a choice. Choice 1: she could get angry and react to that anger by getting out of the car, but he had already driven away. She could stew about the incident (“What did I do to him? How dare he!”) and replay it angrily as she drive to work. Still upset hours later, she could speak about it over dinner when she got home and get angry all over again. I'm in this week's Southern Star, where my latest column explores how cultivating a compassionate mindset can help us to better handle the stresses of daily life. As always, the column will be reproduced on this blog next week. In this week's Southern Star, my latest column looks at the myths and realities regarding the treatment of anxiety. As always, I'll reproduce the column on this blog next week. Laughter helps us to take ourselves and our lives less seriously. In last week's Southern Star, I talked about the healing power of laughter. The column is reproduced below. There’s a certain truth to the old cliché about laughter being the best medicine. The late cognitive psychologist Dr Albert Ellis certainly believed in the power of laughter. Like most cognitive therapists, Ellis believed anxiety and depression were underpinned by distorted and unhelpful thinking patterns. Unlike his fellow cognitive therapists, however, Ellis used some pretty eccentric methods to get his points across. He encouraged his clients to sing songs that made fun of themselves, and would even hold public seminars where he would involve his audience in sing-alongs. One of his favourite anti-anxiety songs was ‘Wild About Worry’, which went to the tune of ‘I’m Just Wild About Harry’. ‘Oh, I'm just wild about worry’, Ellis would sing, ‘And worry's wild about me!/ We're quite a twosome to make life gruesome/ And filled with anxiety!’ Another, ‘What If, What If’, went to the tune of Johann Strauss’s Blue Danube: ‘I think of what if, what if!/And scare myself stiff, yes stiff, quite stiff!/When things are as certain as can be, I ask for a perfect guarantee’. This week's Southern Star is on the shelves. My latest column looks at the power of laughter, how it brings people together and reduces anxiety, depression, guilt and obsessive thinking. As always, the column will be reproduced on this blog next week. Absolutist words like 'totally' and 'definitely' are associated with depression. 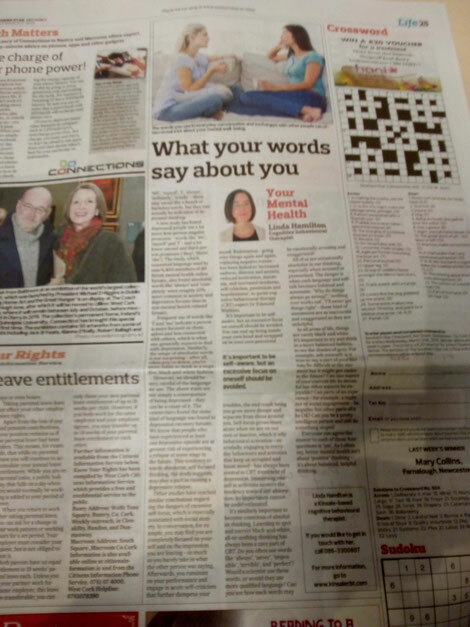 Last week's Your Mental Health column in The Southern Star column explored new research regarding the link between depression and the words people use in their everyday language. The column is reproduced below. "Me”, “myself”, “I”, “always”, “definitely”, “totally” – these may sound like a bunch of harmless words, but they can actually be indicative of depressed thinking. A new study has found depressed people use a lot more first-person singular pronouns – words like “me”, “myself” and “I” – and a lot fewer second- and third-person pronouns (“they, “them”, “she”). The study, which examined language used by over 6,400 members of different mental health online forums, also found absolutist words like “always” and “completely” were roughly 50 per cent more common in anxiety and depression forums than in non-mental health-related forums. Frequent use of words like “I” and “me” indicate a person is more focused on themselves and less connected with others, which is what one generally expects to find with depression. Similarly, the usage of absolutist words is not surprising – after all, when you’re down, you’re more liable to think in a negative, black-and-white fashion. However, we should be very careful of the language we use. The above traits are not simply a consequence of being depressed – they can be a cause of it. The researchers found the same kind of language was found in depression recovery forums. We know that people who have experienced at least one depressive episode are at greater risk of experiencing a relapse at some stage in the future. This tendency towards absolutist, self-focused thinking, the study suggests, may play a part in causing a depressive relapse. Emotional reasoning can play a large part in depression and anxiety. 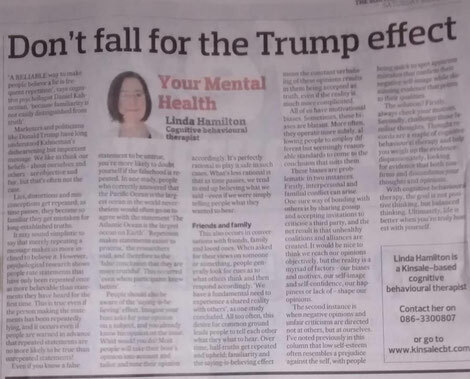 Emotional reasoning – mistaking your feelings for reality – can be bad for your mental health and well-being, as I explained in last week's Southern Star. The column is reproduced below. I feel bad, therefore things are bad. I feel things are hopeless so they must be hopeless. I feel fat, therefore I must be fat. The above statements are examples of emotional reasoning – that is, mistaking one’s feelings for reality. It’s a common habit: most people engage in emotional reasoning to some degree, often relying on their feelings rather than rational thinking to build arguments and make decisions. Have you ever felt anxious about something and thought to yourself, “I can’t explain it, but I know something bad is going to happen”? Emotional reasoning is an assumption your negative emotions ‘necessarily reflect the way things really are’, writes cognitive behavioural therapist Dr David Burns, author of The Feeling Good Handbook. ‘“I feel terrified about going on airplanes. It must be very dangerous to fly.” “I feel guilty. I must be a rotten person.” Or “I feel angry. This proves I’m being treated unfairly”. Or “I feel so inferior. This means I’m a second-rate person”. Or “I feel hopeless. I must really be hopeless”’. Emotional reasoning can drive counter-productive behaviours and cause significant emotional turmoil. Someone with low self-esteem might not apply for a job for which they are qualified because they feel inferior. Someone with an eating disorder might continue with a restrictive diet because they “feel fat”, even though they are dangerously underweight. An anxious person might avoid situations because they feel unsafe, even though there is little evidence supporting their fears. 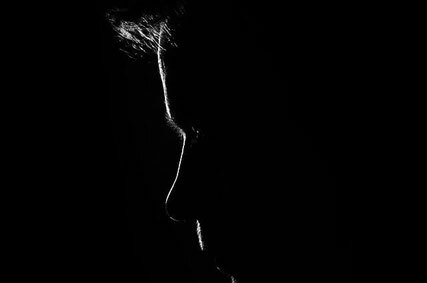 Emotional reasoning can play a large part in depression; the intensely negative feelings of hopelessness associated with depression can cause people to see things as much more dire than they really are. The term “emotional reasoning” is associated with Dr Aaron Beck, the founder of CBT who first described the problem way back in the 1970s. Unfortunately, the myth that it’s good to go with intuition and gut feelings persists. Do an internet search for “gut feelings” and you’ll be greeted with posters such as “Always trust your gut feelings, as they never lie the way people do”; “Your body can pick up on bad vibrations. If something deep inside of you says something is not right about a person or situation, trust it”; “Your brain can play tricks, but your gut is always right”. Emotional pain is wrongly seen as less important than physical pain. Most of us know that it’s reckless to ignore physical pain. It’s important to recognise that the same is true of emotional pain, as I argued in last week's Southern Star. The column is reproduced below. Which is worse – physical pain or emotional pain? One might instinctively think the former is more important. After all, people generally pay a lot more attention to their physical health than their emotional health. When someone says that “health is wealth”, they’re usually referring to physical health. Whereas it’s a cultural norm to periodically check in with your doctor to get a physical check-up and make sure everything is working as it should be, there’s no such thing, really, as an annual psychological check-up. If you pause for a minute, however, you’ll realise the significance of emotional pain. In Breaking Bad, arch-villain Gus Fring threatens the show’s protagonist, Walter White, saying: ‘If you try to interfere... I will kill your wife. I will kill your son. I will kill your infant daughter’. Gangsters, notes British psychologist and Overcoming Depression author Prof. Paul Gilbert, often threaten to harm the children of their enemies rather than their actual enemy, precisely because they recognise that the thought of emotional pain is worse than the thought of physical pain. If you broke your leg many years ago, you’ll likely experience little if any distress when you recall the event. However, if you recall an event that caused psychological pain – the death of a loved one, a cruel comment from school or work bullies, being rejected by a romantic love interest – you will likely experience a fair degree of emotional pain. As a general rule, notes Dr Guy Winch in Psychology Today, physical pain “usually leaves few echoes” whereas emotional pain “leaves numerous reminders, associations and triggers that reactivate our pain when we encounter them”. Similarly, painful emotional experiences shape people much more than painful physical experiences, impacting their mental health and self-esteem. 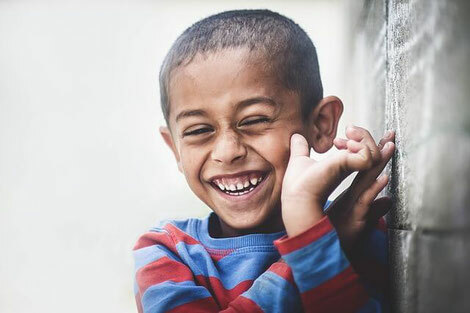 A bullied child may grow up to be an introverted and under-confident adult; someone who lived in fear at an early age might develop chronic anxiety and desperately avoid all kinds of situations which provoke uncertainty; social isolation and rejection can shape negative thinking patterns that drive hopelessness, anger and all kinds of toxic emotions. Our everyday environment shapes our behaviour in all kinds of ways. How can we break bad habits? 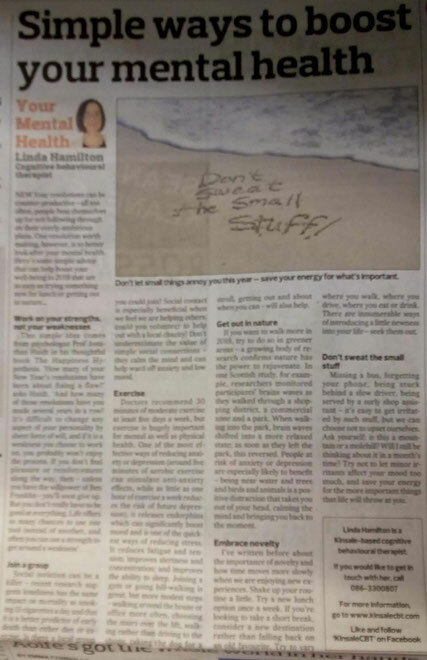 Last week's Your Mental Health column in The Southern Star discussed how changing your environment in all kinds of subtle ways can help. The column is reproduced below. Breaking bad habits isn’t easy, which is why many people will have already given up on their New Year resolutions. To understand why, consider the following story about heroin addiction among US soldiers during the Vietnam war. There had long been a history of opium use in Vietnam and many American soldiers succumbed to the appeal of the drug during the Vietnam war. In 1971, the US government was told 15 per cent of American soldiers had become addicted to heroin. Alarmed, authorities insisted soldiers detox in Vietnam and that they not be allowed return home until they passed a urine drug test. Authorities were concerned recovered addicts would relapse upon returning home. Heroin addiction was regarded as almost incurable and relapse rates were typically extremely high. That didn’t happen in this case. Experts were stunned to discover that within a year of returning home, just 5 per cent of soldiers had relapsed. Almost all – 95 per cent – remained clean. Why? Their environment had changed radically. Vietnam was a psychological minefield, a potent cocktail of trauma, stress and boredom. Heroin was easily available. Soldiers became friendly with fellow users. The environment was a breeding ground for heroin use. In contrast, soldiers returned to a completely different environment in the US – a mundane one, free from the stresses and strains that had catalysed their initial addiction. Breaking bad habits isn't easy, as subject I discuss in this week's Southern Star. As always, the column will be reproduced on this blog next week. Why do people get happier as they get older? Older people tend to be less self-critical and more accepting of negative emotions. People tend to think that life goes downhill as you age, but the research shows the opposite is true: lifetime happiness tends to be U-shaped, with most people getting happier as they get older. Why? My column in the January 26 edition of The Southern Star discussed this important subject, and is reproduced below. As you get older, your looks fade. Mentally, you become less sharp and your memory declines. Your physical health suffers. Well, not everyone gets happier as they age, but it’s pretty common. Countless international studies show lifetime happiness resembles a U-shape. Young people entering adulthood tend to be relatively positive and optimistic, but then happiness levels gradually decline and keep heading south for a few decades. The mid-like crisis is a real phenomenon, with people tending to be least happy when they are in their 40s or early 50s (apparently, 46 is the worst age!). After that, however, things pick up: people keep getting happier right up into their 70s and beyond. Although the evidence supporting the U-bend theory is very strong, the idea is invariably greeted with disbelief. In one study, researchers got a group of 30-year-olds and a group of 70-year-olds and asked them who was likely to be happier. Both groups agreed the youthful people were more likely to be happier, and both were wrong – the older were the happier crew. We live in a culture that has long venerated youth and denigrated old age. The Who’s Pete Townshend famously wrote the line “Hope I die before I get old”, a sentiment echoed by a young Mick Jagger (“What a drag it is getting old”). This, coupled with the aforementioned physical and mental declines associated with age, means people tend to think life goes downhill for most folk, when the truth is otherwise. Why? External factors play a part. As kids leave home and work pressures fade away, people have more time for themselves, more time to do as they please. Even if you remove these factors, however, the U-bend is still evident in the research. That indicates people’s lives change on an internal as well as an external level, and that these changes help them to become more happy and content. Southern Star: Older, wiser and happier? Contrary to popular belief, people tend to get happier as they get older. My column in this week's Southern Star examines the reasons why. As always, the column will be reproduced on this blog next week. The main reasons people fail with resolutions is they tend to be unrealistic and vague. 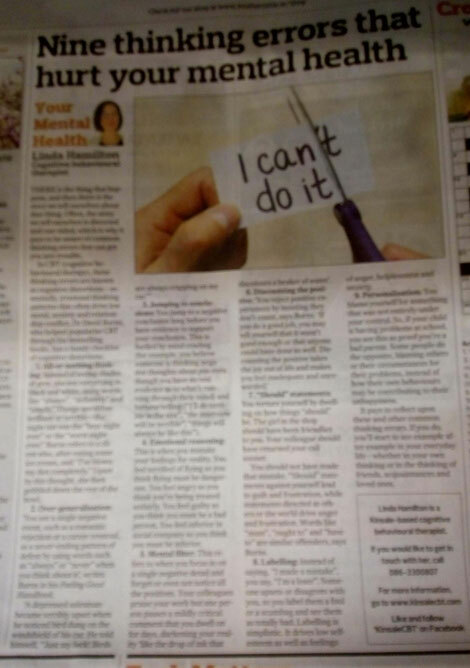 In last week's Southern Star, my column examined some practical tips from CBT psychologist Dr Judith Beck relating to new year resolutions. The column is reproduced below. This column is going to offer some advice on new year resolutions. Before I start, however, let me first explain why I really would prefer not to be writing about new year resolutions. In this week's Southern Star, my column explores some tips from CBT psychologist Dr Judith Beck relating to new year resolutions and goal-setting. As always, the column will be reproduced on this blog next week. Financial, familial and psychological pressures can weigh on people at Christmas. It’s great to invest in Christmas, but the holiday season also brings its own pressures, not least the pressure to be happy. 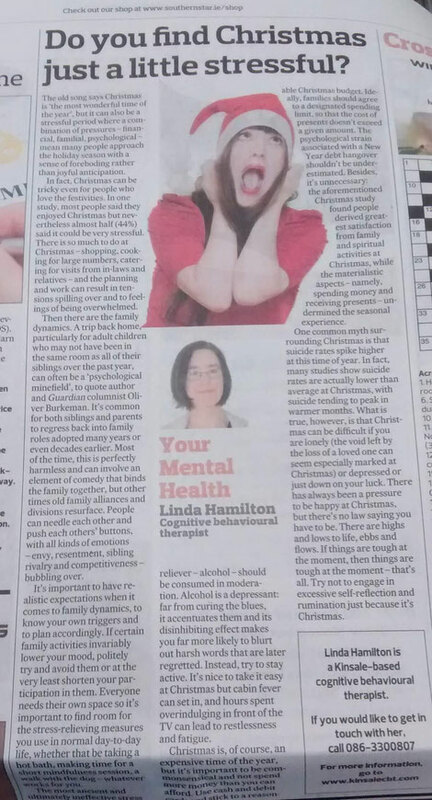 Last week's Your Mental Health column in the Southern Star offered some tips on how to cope with Christmas stress. The column is reproduced below. The old song says Christmas is “the most wonderful time of the year”, but it can also be a stressful period where a combination of pressures – financial, familial, psychological – mean many people approach the holiday season with a sense of foreboding rather than joyful anticipation. In fact, Christmas can be tricky even for people who love the festivities. In one study, most people said they enjoyed Christmas but nevertheless almost half (44 per cent) said it could be very stressful. There is so much to do at Christmas – shopping, cooking for large numbers, catering for visits from in-laws and relatives – and the planning and work can result in tensions spilling over and to feelings of being overwhelmed. Then there are the family dynamics. A trip back home, particularly for adult children who may not have been in the same room as all of their siblings over the past year, can often be a ‘psychological minefield’, to quote author and Guardian columnist Oliver Burkeman. It’s common for both siblings and parents to regress back into family roles adopted many years or even decades earlier. Most of the time, this is perfectly harmless and can involve an element of comedy that binds the family together, but other times old family alliances and divisions resurface. People can needle each other and push each others’ buttons, with all kinds of emotions – envy, resentment, sibling rivalry and competitiveness – bubbling over. The most ancient and ultimately ineffective stress reliever – alcohol – should be consumed in moderation. Alcohol is a depressant: far from curing the blues, it accentuates them and its disinhibiting effect makes you far more likely to blurt out harsh words that are later regretted. Instead, try to stay active. It’s nice to take it easy at Christmas but cabin fever can set in, and hours spent overindulging in front of the TV can lead to restlessness and fatigue. Christmas is, of course, an expensive time of the year, but it’s important to be commonsensical and not spend more money than you can afford. Use cash and debit cards and stick to a reasonable Christmas budget. Ideally, families should agree to a designated spending limit, so that the cost of presents don’t exceed a given amount. The psychological strain associated with a new year debt hangover shouldn’t be underestimated. Besides, it’s unnecessary: the aforementioned Christmas study found people derived greatest satisfaction from family and spiritual activities at Christmas, while the materialistic aspects – namely, spending money and receiving presents – undermined the seasonal experience. The old song says Christmas is “the most wonderful time of the year”, but it can also be a stressful period where a combination of pressures – financial, familial, psychological – mean many people approach the holiday season with a sense of foreboding rather than joyful anticipation. In this week's Southern Star, I offer some advice on coping with Christmas stress. The column will be reproduced on this blog next week. Gratitude is associated with physical and psychological health benefits. Does the idea of cultivating gratitude via gratitude diaries and the likes make you squirm? It shouldn’t – far from being touchy-feely do-gooderism, practising gratitude helps people live happier and more objective lives. Most of us are much quicker to notice what goes wrong in our everyday lives whilst ignoring or forgetting about what goes right. Think of it this way – when you’re running or cycling into a strong wind, you’ll focus on how you’re being blown back and frustrated by the breeze. Then you turn around and the headwind becomes a tailwind, pushing you forward, but do you notice it? Or is your memory dominated by that strong but temporary headwind? 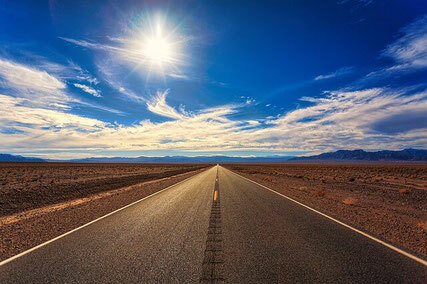 The analogy is used by Cornell University psychologists in a new study, ‘The headwinds/tailwinds asymmetry’. In a series of clever experiments, researchers found Republican and Democrat voters both believed the electoral map worked against their own party; football fans focused on the difficult games in their team’s schedules; sons and daughters thought their parents were harder on them than on their siblings; and academics thought they faced bigger career hurdles than their colleagues in other departments. Actively cultivating gratitude militates against this tendency, helping us see our lives in a more objective fashion. It also improves our psychological and physical health. In one famous study, ‘Counting Blessings Versus Burdens’, one group of students were asked to look back on the previous week and write up to five things they were grateful or thankful for. In contrast, a second group was asked to list up to five hassles they had experienced, with both groups continuing the practice over a 10-week period. After 10 weeks, the gratitude group felt better and more optimistic about their lives. Notably, they also exercised more and paid fewer visits to doctors than the group who focused on their daily hassles. Countless other studies have reported similar findings. In another study, people experienced a big happiness boost after writing and delivering a letter of gratitude to someone they had not properly thanked for an earlier act of kindness. Another paper found expressing gratitude to a partner changed their view of the relationship; not only that, it helped people to be more comfortable in expressing their relationship concerns. People are unable to accurately predict what will make them happy or unhappy. 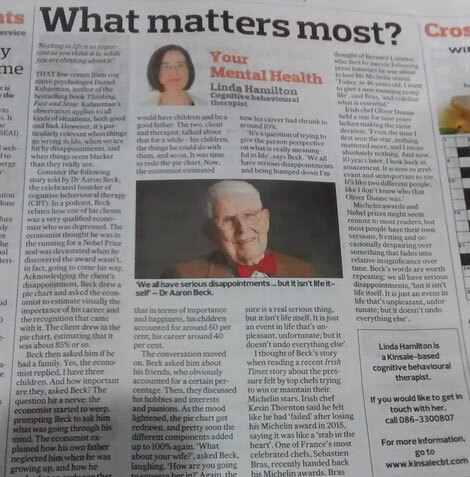 Last week's 'Your Mental Health' column in the Southern Star looked at what people can learn from happiness research, particularly the findings of 'Professor Happiness', psychologist Daniel Gilbert. The column is reproduced below. All of us can imagine scenarios that seem nightmarish, just as we can picture idyllic lives where we don’t have a care in the world. But what if the nightmarish scenario turned out to be more manageable than you thought, and the blissful scenario wasn’t actually that blissful? All of us can imagine scenarios that seem nightmarish, just as we can picture idyllic lives where we don’t have a care in the world. But what if the nightmarish scenario turned out to be more manageable than you thought, and the blissful scenario wasn’t actually that blissful? I explore such matters in my 'Your Mental Health' column in this week's Southern Star, drawing on the research of 'Prof. Happiness', psychologist Daniel Gilbert. As always, the column will be reproduced on this blog next week. 'We all have serious disappointments... but it isn’t life itself' - CBT founder Aaron Beck. 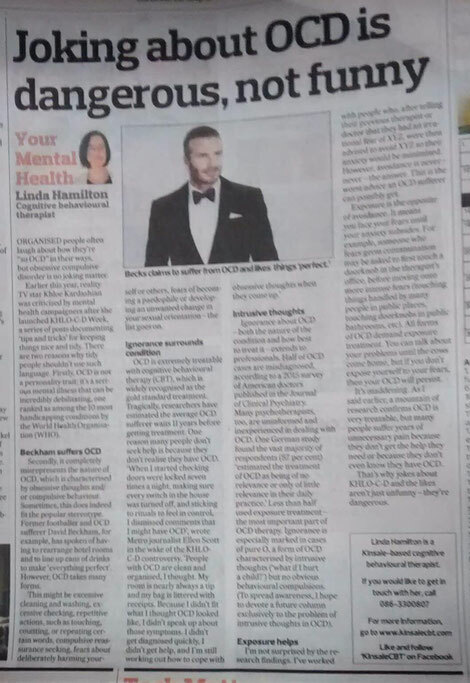 In last week's Southern Star, I discussed how when things go wrong in life, CBT can help us see that things may not be as black as they seem. The column is reproduced below. 'Nothing in life is as important as you think it is, while you are thinking about it'. That line comes from cognitive psychologist Daniel Kahneman, author of the bestselling book Thinking, Fast and Slow. Kahneman’s observation applies to all kinds of situations, both good and bad. However, it’s particularly relevant when things go wrong in life, when we are hit by disappointments, and when things seem blacker than they really are. All of us will experience seemingly major disappointments in life, but it's important to keep a sense of perspective on what is really meaningful, as I discuss in my column in this week's Southern Star. Holding positive views about ageing is associated with longevity. 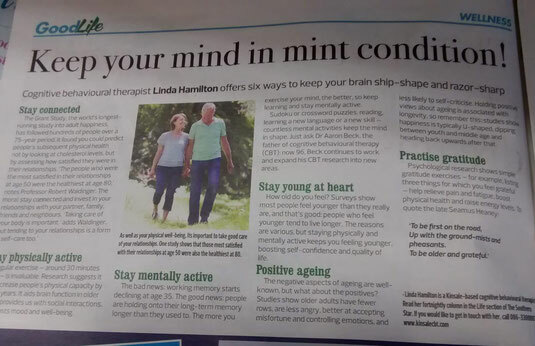 I had a short piece in last week's Southern Star where I outlined six tips for positive ageing. The piece is reproduced below. The Grant Study, the world’s longest-running study into adult happiness, has followed hundreds of people over a 75-year period. It found you could predict people’s subsequent physical health not by looking at cholesterol levels, but by assessing how satisfied they were in their relationships. “The people who were the most satisfied in their relationships at age 50 were the healthiest at age 80”, notes Professor Robert Waldinger. The moral: stay connected and invest in your relationships with your partner, family, friends and neighbours. “Taking care of your body is important”, adds Waldinger, “but tending to your relationships is a form of self-care too”. 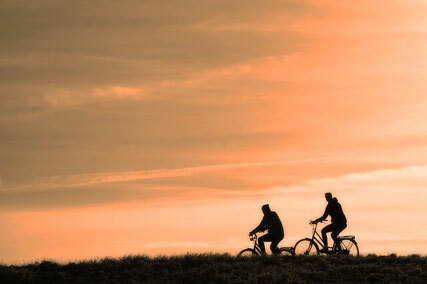 Regular exercise – around 30 minutes daily – is invaluable. Research suggests it can increase people’s physical capacity by 10–15 years. It aids brain function in older adults, provides us with social interactions, and boosts mood and well-being. The bad news: working memory starts declining at age 35. The good news: people are holding onto their long-term memory longer than they used to. The more you exercise your mind, the better, so keep learning and stay mentally active. Sudoku or crossword puzzles, reading, learning a new language or a new skill – countless mental activities keep the mind in shape. Just ask Dr Aaron Beck, the father of cognitive behavioural therapy (CBT): now 96, Beck continues to work and expand his CBT research into new areas. How old do you feel? Surveys show most people feel younger than they really are, and that’s good: people who feel younger tend to live longer. The reasons are various, but staying physically and mentally active keeps you feeling younger, boosting self-confidence and quality of life. The negative aspects of ageing are well-known, but what about the positives? Studies show older adults have fewer rows, are less angry, better at accepting misfortune and controlling emotions, and less likely to self-criticise. Holding positive views about ageing is associated with longevity, so remember this: studies show happiness is typically U-shaped, dipping between youth and middle age and heading back upwards after that. Up with the ground-mists and pheasants. In the Good Life supplement accompanying this week's Southern Star, I have a short piece outlining six tips for positive ageing. CBT suggests we are largely disturbed not by events, but by the view we take of them. 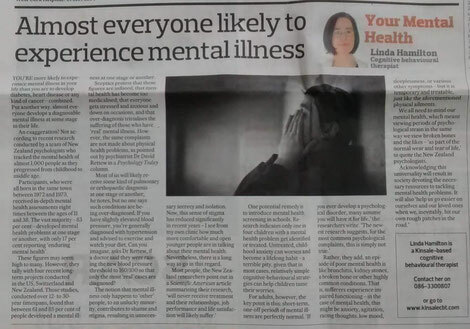 In last week's Southern Star, I explored one of the key messages of CBT: the idea that emotional distress is caused more by how we see events than the events themselves. If you disagree, please read the column, which I hope will give you some food for thought! Here’s a question to ponder: are your emotions guided more by events and situations, or by how you see the events and situations? One of the key messages of CBT is that people ‘are disturbed not by things, but by the view which they take of them’, as the late psychologist Albert Ellis put it. The idea is not a new one – the Stoics of ancient Greece had a similar philosophy. 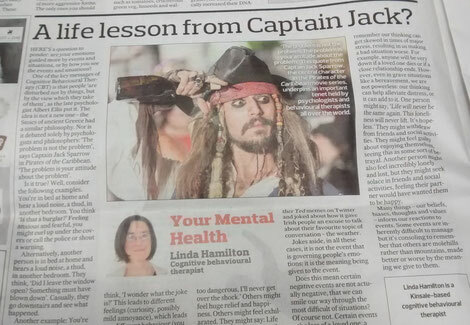 Nor is it debated solely by psychologists and philosophers: ‘The problem is not the problem’, says Captain Jack Sparrow in Pirates of the Caribbean. ‘The problem is your attitude about the problem’. You’re in bed at home and hear a loud noise, a thud, in another bedroom. You think ‘Is that a burglar?’ Feeling anxious and fearful, you might curl up under the covers or call the police or shout a warning. Alternatively, another person is in bed at home and hears a loud noise, a thud, in another bedroom. They think, ‘Did I leave the window open? Something must have blown down’. Casually, they go downstairs and see what happened. Another example: You’re at work and see two office colleagues giggling at their desks. Your first thought is negative: ‘They’re laughing at me’. Feeling angry and defensive, you ignore your colleagues and keep to yourself for the next few hours, complaining to your partner about your job and colleagues when you get home. Alternatively, you might think, 'I wonder what the joke is?’ This leads to different feelings (curiosity, possibly mild annoyance), which leads to a different behaviour (you keep talking as normal). A third example. In 2009, a plane crashed in the Hudson River in New York in 2009. The pilot’s skill meant all 155 people came out alive. How did those people feel? Some might have been distressed and anxiety-ridden – they nearly died. They might say, ‘I’m never flying again, it’s too dangerous, I’ll never get over the shock.’ Others might feel huge relief and happiness. Others might feel exhilarated. They might say: Life is short, carpe diem, seize the day! Travel the world while you still can! Are our emotions guided more by events and situations, or by how we see the events and situations? 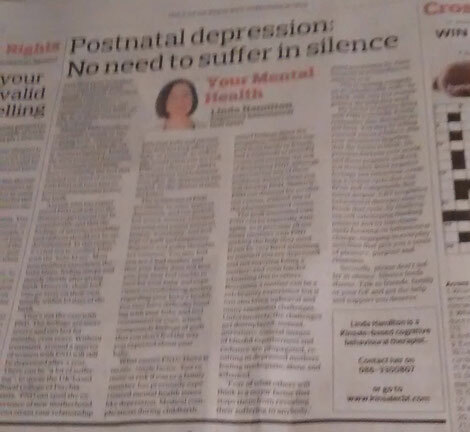 It's crucial to have insight into this nuanced and very important subject, which I discuss in my 'Your Mental Health' column in this week's Southern Star. As always, the column will be reproduced on this blog next week for non-West Cork readers who may not be able to access this week's paper. 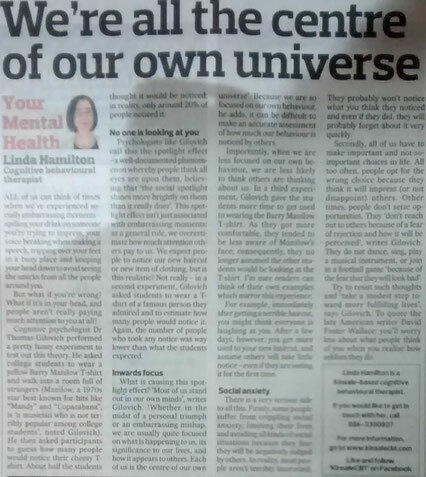 I'm in this week's Southern Star, where my latest column focuses on the value of fostering good mental health and learning life skills through CBT. Books like The Secret offer advice that can do more harm than good. 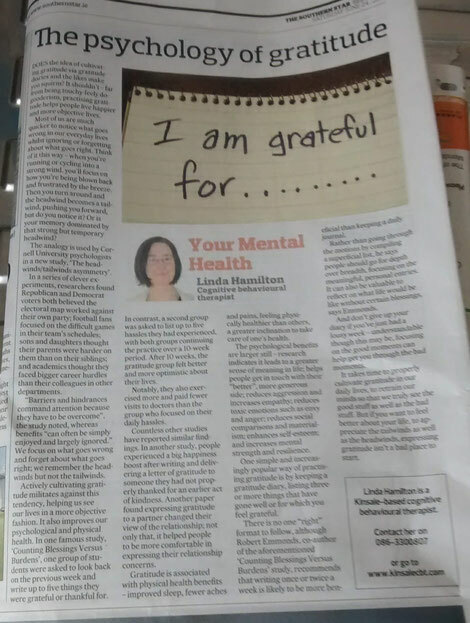 Some self-help books offer potentially harmful advice on positive thinking, as I noted in in last week's Your Mental Health column in The Southern Star. The column is reproduced below. It’s better to view the glass as half-full rather than half-empty, but be warned: an excessive focus on positive thinking is not good for your mental health. ‘Positive thinking often involves trying to believe upbeat statements such as “Every day, in every way, I am getting better and better,” in the absence of evidence or even in the face of contrary evidence”, cautions psychologist Martin Seligman. Louise Hay, for example, recommended readers recite positive affirmations such as ‘All is well in my world. Everything is working out for my highest good’, ‘I live in the perfect space’, and ‘I always work with and for wonderful people. I love my job.’ The Secret, too, is full of affirmations, many of them materialistic (‘You will attract everything you require – money, people, connections’). One affirmation featured in a trailer for the movie version is, ‘Everything I touch turns to gold’. A man then touches a statue; it turns golden. We’re told our thoughts determine our physical health. "Illness cannot exist in a body that has harmonious thoughts”, writes Rhonda Byrne. “We create every illness in our body”, according to Louise Hay. “Releasing resentment will dissolve even cancer” (she claimed to have cured herself of cancer in the 1970s). Venereal disease, she said, is linked to sexual guilt; kidney stones are caused by “lumps of undissolved anger”; Alzheimer’s is linked to a “refusal to deal with the world as it is”; rheumatoid arthritis to “feeling victimized” and “chronic bitterness”. 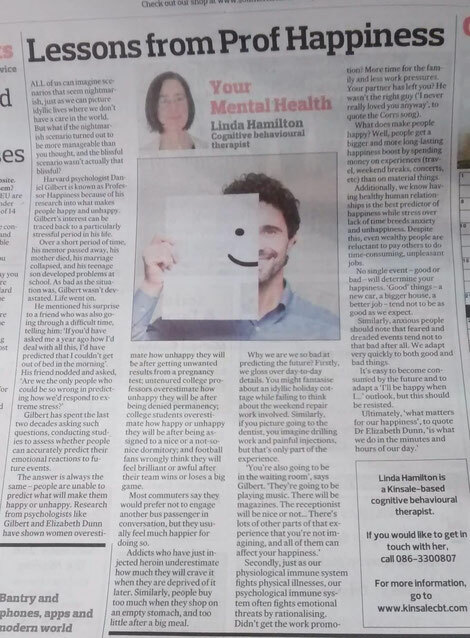 I'm in this week's Southern Star, where my latest column explores how an excessive focus on positive thinking can be bad for people's mental health. Behavioural experiments help call the bluff of our negative thoughts. Last week's Southern Star column looked at why we should put our thoughts on trial with behavioural experiments. The column is reproduced below. Imagine the following. You call into your neighbour’s house and are surprised to see her sprinkling salt all over the floor. ‘Why are you doing that?’, you ask. ‘To keep the tigers away’, she responds. Stunned, you point out there are no tigers in Ireland. ‘Exactly’, she responds. Our thoughts and beliefs can feel true, but are they true? One way to find out is to conduct behavioural experiments, a subject I discuss in this week's Southern Star, which is now on the shelves. Almost everyone struggles with their mental health at some stage. My most recent Southern Star column explored recent research indicating that almost everyone experiences mental illness at some stage of their life. The column is reproduced below. You’re more likely to experience mental illness in your life than you are to develop diabetes, heart disease or any kind of cancer – combined. Put another way, almost everyone develops a diagnosable mental illness at some stage in their life. An exaggeration? Not according to recent research conducted by a team of New Zealand psychologists who tracked the mental health of almost 1,000 people as they progressed from childhood to middle age. Participants, who were all born in the same town between 1972 and 1973, received in-depth mental health assessments eight times between the ages of 11 and 38. The vast majority – 83 per cent – developed mental health problems at one stage or another, with only 17 per cent reporting 'enduring mental health' (continued below). These figures may seem high to many. However, they tally with four recent long-term projects conducted in the US, Switzerland and New Zealand. Those studies, conducted over 12- to 30-year timespans, found that between 61 and 85 per cent of people developed a mental illness at one stage or another. 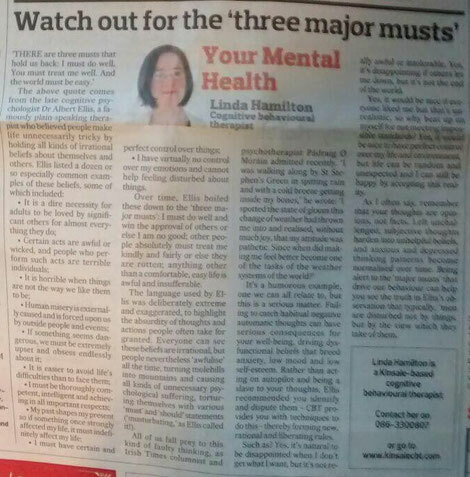 In last week's Southern Star, I advised people to watch out for the 'three major musts' that hold us back and generate unnecessary psychological distress. The column is reproduced below. I have virtually no control over my emotions and cannot help feeling disturbed about things. Over time, Ellis boiled these down to the ‘three major musts’: I must do well and win the approval of others or else I am no good; other people absolutely must treat me kindly and fairly or else they are rotten; anything other than a comfortable, easy life is awful and insufferable. We often mistake familiarity for truth. We're more inclined to believe statements if we've heard them before, even if there's no truth to them. Confusing familiarity with truth can lead to interpersonal problems and conflict, as I explored in last week's Southern Star. The column is reproduced below. 'A reliable way to make people believe a lie is frequent repetition’, says cognitive psychologist Daniel Kahneman, ‘because familiarity is not easily distinguished from truth’. Marketers, propagandists and politicians like Donald Trump have long instinctively understood Kahneman’s message. It’s a disheartening message but a very important one. We like to think our beliefs – about ourselves and others – rest on objective foundations, but that’s often not the case. Lies, distortions and misconceptions get repeated; after a certain amount of time, they become so familiar that they get mistaken for long-established truths. 'Bad news' stories can induce anxiety in children. Terrorist atrocities and other bad news stories can distress children, especially those of a sensitive nature. My recent Southern Star column on the subject is reproduced below. Many children are troubled by what they see on the news. The Manchester atrocity was especially harrowing, as it specifically targeted pre-teen and teenage concert-goers. The increased frequency of ISIS attacks in Europe indicates the topic will not vanish from our TV screens any time soon. 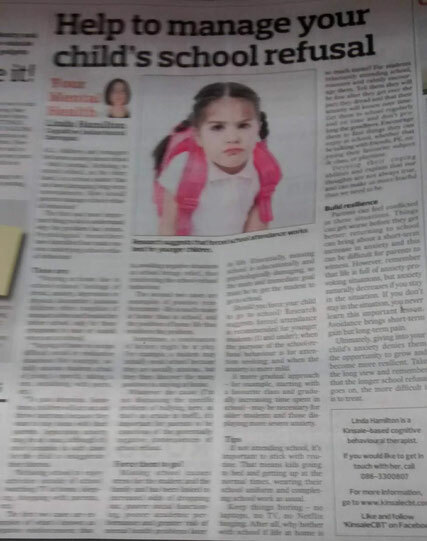 Southern Star readers can find my latest column in page 2 of the Community section, where I discuss how to talk to children about terrorism and other bad news stories. The Leaving and Junior Cert exams take place in a few weeks. 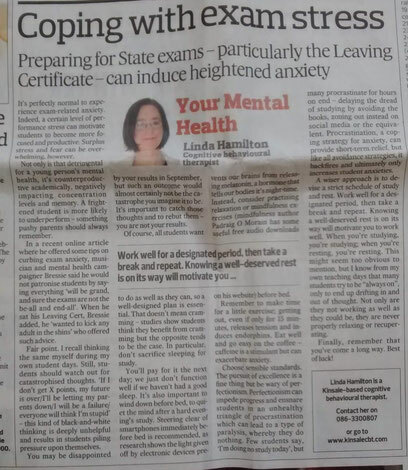 In this week's Southern Star, I offer some tips for students on how to cope with exam stress. Southern Star: Anxious parent, anxious child? Children are little detectives who pick up on parental anxiety. 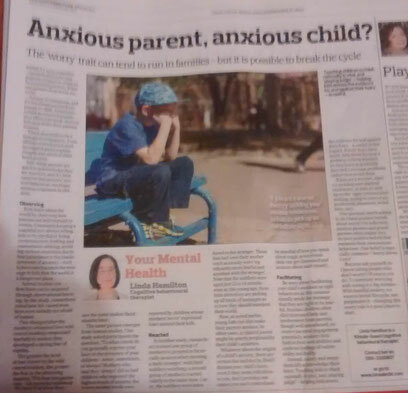 Last week's Southern Star column noted how anxiety tends to run in families and offered tips to parents on how to break the cycle. The column is reproduced below. Anxiety runs in families – research shows the vast majority of anxious children have anxious parents. What can parents do to break the cycle? Anxiety is contagious, and it’s not always passed from parent to child. Sometimes, a child-to-parent transmission effect is at work: anxious kids may make their parents anxious. There also tends to be a biological component. 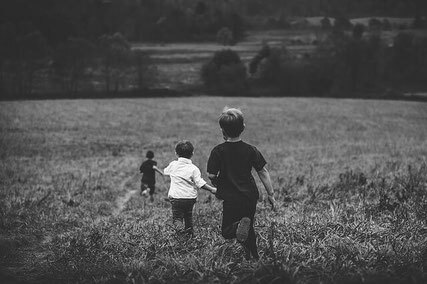 Twin, siblings and adoption studies suggest genes explain roughly one-third of childhood anxiety. Column: Anxious parent, anxious child? Anxiety runs in families – research shows the vast majority of anxious children have anxious parents. In this week's Southern Star, I explore the research and offer tips on how parents can do to break the cycle. Everyone experiences stress, but some deal with it better than others. In last week's Southern Star column, I explored how different people deal with stress in different ways and examined the problem of self-generated stress (that is, stress that we unintentionally bring on ourselves). The column is reproduced below. Stress is a universal experience. Everyone experiences stress, but some deal with it better than others. Some brush off seriously stressful situations; others are crippled by seemingly minor predicaments. Some situations are inherently stressful; other times, we bring stress on ourselves. Can stress be avoided? If not, can it be minimised? Then there are the persistent everyday stresses – trying to meet workplace deadlines, dealing with a difficult colleague, getting that college essay in on time whilst keeping up to speed with other subjects as the exam date draws nearer, having to defuse your child’s temper tantrum while simultaneously preparing dinner. 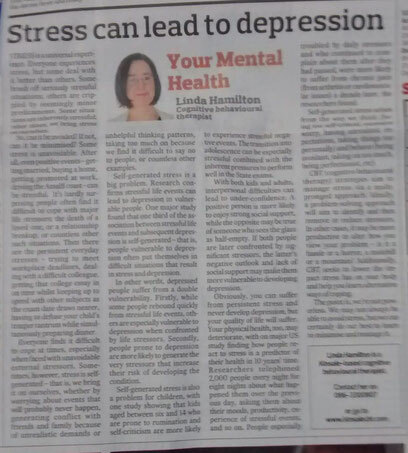 My 'Your Mental Health' column in this week's Southern Star looks at stress, with a particular focus on the problem of self-generated stress. Southern Star: Mindfulness - a passing fad or the real deal? Mindfulness is not a dubious fad, but nor should it be seen as a panacea. 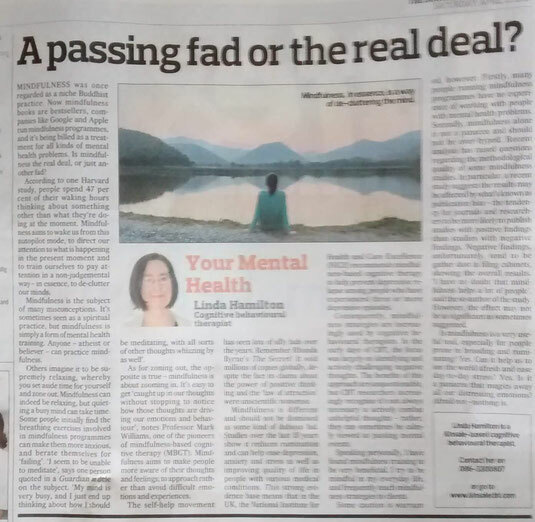 In last week's 'Your Mental Health' column in The Southern Star, I examined what the research says about the alleged mental health benefits of mindfulness. The piece is reproduced below. Mindfulness was once regarded as a niche Buddhist practice. Now mindfulness books are bestsellers, companies like Google and Apple run mindfulness programmes, and it’s being billed as a treatment for all kinds of mental health problems. Is mindfulness the real deal, or just another fad? According to one Harvard study, people spend 47 per cent of their waking hours thinking about something other than what they’re doing at the moment. Mindfulness aims to wake us from this autopilot mode, to direct our attention to what is happening in the present moment and to train ourselves to pay attention in a non-judgemental way – in essence, to de-clutter our minds. Others imagine it to be supremely relaxing, whereby you set aside time for yourself and zone out. Mindfulness can indeed be relaxing, but quieting a busy mind can take time. 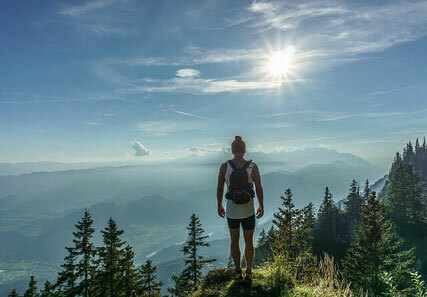 Some people initially find the breathing exercises involved in mindfulness programmes can make them more anxious, and berate themselves for “failing”. ‘I seem to be unable to meditate’, says one person quoted in a Guardian article on the subject. ‘My mind is very busy, and I just end up thinking about how I should be meditating, with all sorts of other thoughts whizzing by as well’.